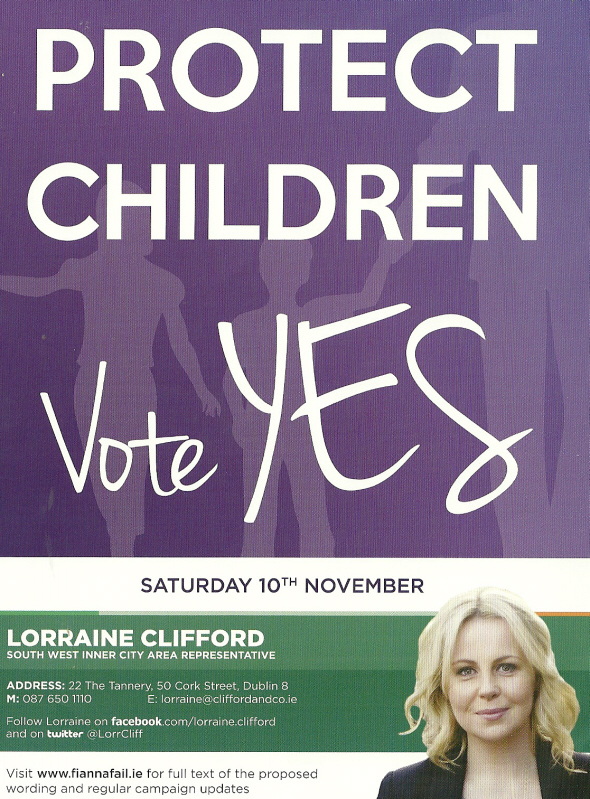 From the Children’s Rights Referendum Campaign a “Protect Children – Vote Yes” Leaflet from Lorraine Clifford the Fianna Fail Representative in the South West Inner City Ward of Dublin City Council. 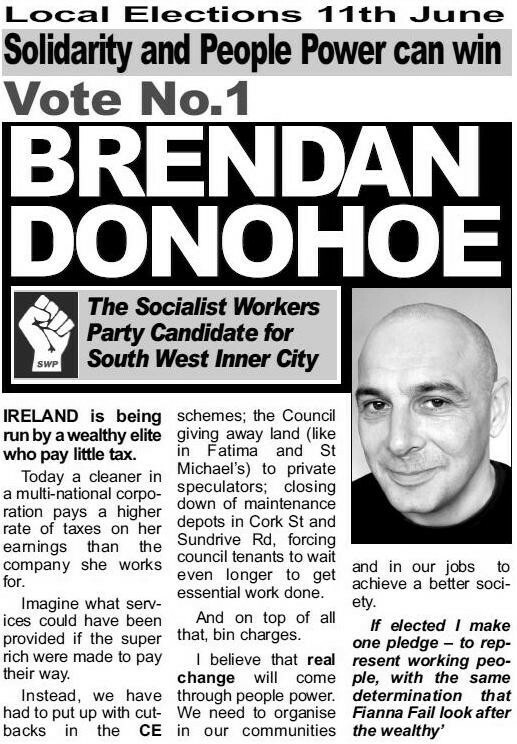 From the 2004 Local ELections a leaflet for Socialist Workers Party candidate Brendan Donohoe who was running for a seat on Dublin City Council in the South West Inner City Ward. Donohoe polled 308 votes and failed to win a seat. This is an unusual leaflet, from Fianna Fail candidate Eamonn Walsh. Éamonn Walsh originally sought the nomination for South West Inner City Ward for Dublin City Council. This leaflet is from the SW Inner City. However he ended up being selected and winning a seat on South Dublin County Council in the Tallaght Central Ward. Note the Polish on the leaflet as European Union Citizens are allowed vote in the Local and European Elections. 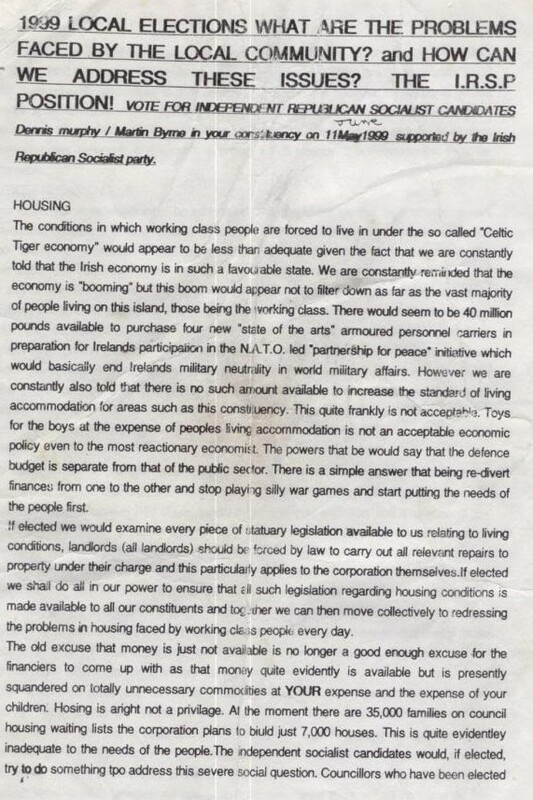 From the 2004 Local Elections for Dublin City Council, a newsletter from Green Party candidate Patricia Gardiner running in the South West Inner City Ward. Patricia Gardiner polled 952 votes and missed out on the final count. She since sought the Green Party nomination in 2007 for Sligo-North Leitrim but was not selected.